The 5th Annual 9/11 Film Festival, a benefit for the Northern California 9/11 Truth Alliance, Architects and Engineers for 9/11 Truth, and the NYC Coalition for Accountability Now (NYCCAN), will be held Wednesday evening and Thursday from noon onwards, September 9th and 10th, 2009 at the Grand Lake Theater, 3200 Grand Avenue in Oakland. The festival opens with the world premiere of “Loose Change 9/11: An American Coup” with filmmaker Dylan Avery. Bonnie Faulkner, host of KPFA's Guns and Butter will be the Mistress of Ceremonies. Guest speakers include: Mike Daly, an Ironworkers 377 member, presenting an excerpt from the film “Metal of Honor,” a firsthand account of the ironworkers who were first responders; Richard Gage, AIA, founder of Architects and Engineers for 9/11 Truth; Dr. David Ray Griffin, author of 36 books, including 10 on the topic of 9/11; Janette MacKinlay, artist and survivor, a member of the Executive Council of NYCCAN, the organization working to get an initiative on the November ballot for an independent, impartial investigation into the events of September 11, with subpoena power; and Gabriel Day, peace activist and board member of 911Truth.org. On Thursday beginning at noon, the films “Fabled Enemies” by Jason Bermas, “Kill the Messenger” by French filmmakers Mathieu Verboud and Jean R. Viallett, and “The New American Century” by Italian filmmaker Massimo Mazzucco will be followed by speakers Ken Jenkins, Dr. Paul Rea, Mickey Huff, and Dr. Peter Phillips. Comedian Swami Beyondananda is scheduled to both enlighten and lighten up the audience. Thursday evening, Eric Nadler will present the West Coast premiere of “Anthrax War” which he made with Bob Coen along with a companion book, Dead Silence. The film begins by investigating the anthrax attacks that took place in the wake of 9/11, but it is global in scope, examining the far-flung bio-weapons labs, their privatization, and the overlap between the bio-weapons and vaccine manufacturers in a burgeoning $50 billion industry. Thursday’s keynote speaker, Dr. David Ray Griffin, will address the mysterious collapse of World Trade Center 7 and why the final official report about 9/11 is unscientific and false, the subject of his latest book. On Wednesday, Griffin will briefly discuss “Osama Bin Laden: Dead or Alive?” which challenges the foundational myth surrounding 9/11, an event still underpinning the “war on terror” and the expansion of forces in Afghanistan. provides greater historical context, damning eyewitness testimony to the explosions that took place in World Trade Center 7 on the morning of September 11, and the latest details about physicist Dr. Steven E. Jones's discovery of unexploded military grade thermate in the WTC dust. The film “7/7: Ripple Effect,” the British “Loose Change,” questions the official story about the London bombings (the film producer was jailed for sending DVDs to the judge, jury, and victims’ families). “Fabled Enemies” examines the links between the alleged 9/11 hijackers, the military, and the intelligence agencies. “Kill the Messenger” tells the story of Sibel Edmonds, the most silenced witness in US history, who formed the National Security Whistleblowers Coalition. “The New American Century” looks critically at the Project for the New American Century and the history of US militarism. Tickets to the festival are $10 for each day and available in advance at the theater and supporting bookstores. A complete schedule with details about the speakers and films is posted at http://www.communitycurrency.org/filmfestival2009.html. The 9/11 Film Festival is supported by Modern Times Bookstore, City Lights Bookstore, Pegasus and Pendragon Books, KPFA, Project Censored, Media Freedom Foundation, The Alameda County Green Party, San Francisco Bay Guardian, and the Grand Lake Theater. WoW! WoW! What a dynamic lineup! Like a "Woodstock on the West-Coast"...a 9/11 Truth rendition. TomT on Sun, 08/16/2009 - 5:48am. 6:20 Film: Metal of Honor with ironworker Mike Daly. 7:20 Dr. David Ray Griffin- Osama bin Laden-Dead or Alive? 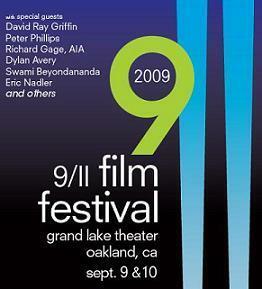 The 9/11 Film Festival is at the Grand Lake Theater in Oakland, CA. Tickets are now on sale at these locations. I highly recommend buying tickets in advance, as we expect these shows to sell out quickly. I hope to see some of you 911bloggers there. Please feel free to say hello to me, I will be the guy racing around keeping the show on schedule, but will occasionally stop to catch my breath, probably near the 911tv.org table on the far left side of the lobby. LeftWright on Sun, 08/16/2009 - 9:11am. zombie bill hicks on Sun, 08/16/2009 - 10:12am. Wish I was there also! John Bursill on Mon, 08/17/2009 - 7:15am. I wish I could be there. It will be ASTOUNDING. Joe on Sun, 08/16/2009 - 10:38am. You are doing a great job. Arrive early so you can find parking. Hope to see you there. Excellent lineup of films! 9-11 Joe on Sun, 08/16/2009 - 9:28am.